Pylon: Rogue is a rogue-like action title with a few characters and a progression system of sorts. The combat is unforgiving so that death may occur often. Nothing carries over from one run to the next, but you can unlock items. Each run is procedurally generated to ensure replayability and sustained enjoyment. You traverse across a world map and choose whether to enter an area or visit the shop. Once you enter an area, you cannot leave until you find an exit. Each room hosts waves of enemies, although sometimes you might luck out and only face one; you cannot leave the room until you clear it. After you clear the room, a treasure chest or exit might spawn. If you complete each room, you are awarded a large chest. You cannot re-enter an area once you leave. There are four areas in the starting “world”. Once you complete these, you may then attempt the boss. The shop changes inventory after leaving an area, but some necessities are always available. These include scrolls, needed for your ultimate, and health potions. What changes are the equipable items. For the three main equipment pieces, you may only equip one of each. But, for the trinkets, charms, and artifacts, you need not worry about having to choose which is better. Once, I noticed these miscellaneous items had a level aspect to them, but no indication of how to level them. Afterward, I noticed just a numerical value stating how many items of that specific type I had in my inventory. You have three characters from which to choose, each with their own unique weapon sets. Only one weapon set is available at the outset; the others you unlock or shall become available later in Pylon’s development. The sureshot (archer) is best if your preferred playstyle is from afar. But, the arrows don’t deliver much damage and cannot control a crowd, so you might have to spam the attack button. The other two characters, the moneydin (warrior) and the rock (golem creature), offer more health and output damage. The archer has the least amount of health, making any choice a compromise. 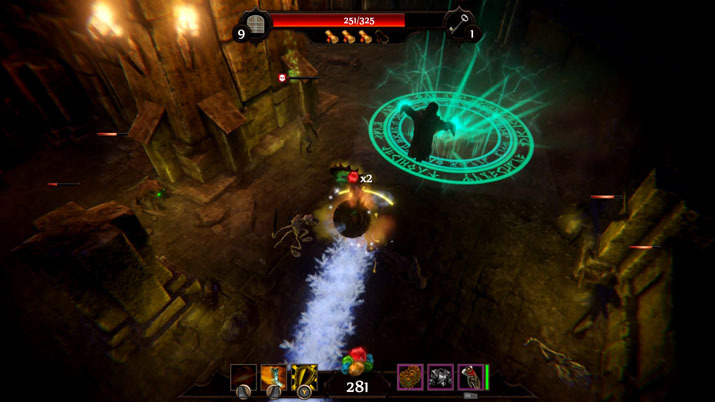 Each character has three moves: a basic attack, an evasive move, and an ultimate. To use the evasive moves for the moneydin and the rock, you must keep the button pressed throughout use, whereas, with the archer, you only need to press the button once to execute a full roll, which proves handy. It seems that with any character you choose, there’s a button you must spam; given that utilizing these evasive moves helps ensure survival, it can be exhausting to constantly attack, evade, go in again, attack, repeat. You can charge your basic attack, but timing it properly is tricky. It’s needed to break through an enemy’s guard. Finally, you may use your ultimate attack only if you have a skill scroll. It can decimate a surrounding horde of enemies, so use it only in dire circumstances, given that you have a max capacity of four of these scrolls. You may obtain more from a chest or the shop. Combat is unforgiving, and even if you’re at full health at the beginning of a room, this is no guarantee that you’ll survive. Certain enemies spit poison and damage you continuously if you’re in the affected circle, making smaller rooms tricky. With other enemies, it’s difficult to see when they’re about to strike if they are small and easily blend in with their surroundings. There’s no difficulty slider available, thereby preventing players from having the option to alter the game according to one’s ability. But, the developers are looking into this . As you go through multiple runs, you get better mostly by learning the techniques of the enemies and familiarizing yourself with the characters. No leveling system exists, nor do you have the opportunity to upgrade a character or item during or after a run. There are three to start, so try them out and see which works best for you. You do unlock items by accomplishing certain feats, defeating a number of enemies, and so on. But, there’s no guarantee you’ll encounter what you’ve unlocked during a run. Unfortunately, there’s no indication of how close you are to unlocking a particular item. 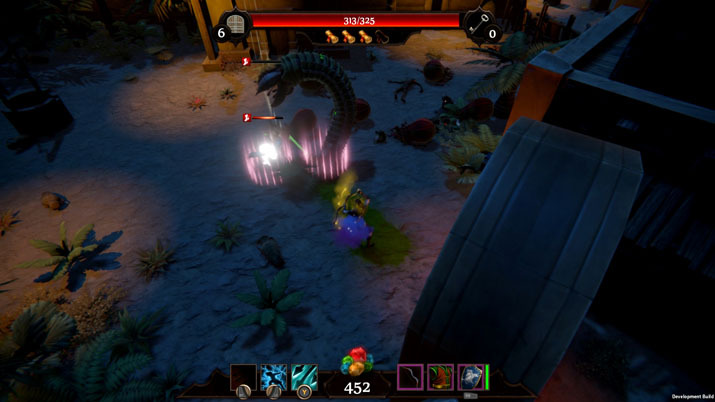 Each run is procedurally generated, offering replayability. But ultimately, the goal is to see how far you’re able to go. However, without leaderboards or progress or stat tracker of any sort, it’s hard to play this with the same enthusiasm on the fiftieth run as you did on your first run. Particular items add intrigue, keeping enjoyment alive, when they provide a visible effect--like the one that emits a slime behind you that slows enemies. Although Pylon: Rogue provides fun, the lack of upgrades that carry over, aside from unlocking more items, may deter players. Enjoyment might diminish after so many runs, depending on what you’re looking for in a title, but that’s simply the nature of the genre. However, if you like roguelikes, such as The Binding of Isaac, and enjoy difficult titles, you’ll likely enjoy this.